We know it doesn’t feel like it but the end of summer is nigh and over the next few months things are going to cool down and soon enough you’ll be putting on jackets and scarves to brave the winter chill. And you’ll also be dreaming of a winter escape. Somewhere warm and dry – maybe a little adventurous. One place that ticks all those boxes in the Northern Territory. 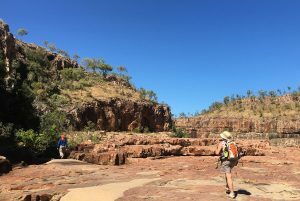 Life’s An Adventure offers several pack-free walking tours of NT that will not only beat your winter blues but also show you a part of Australia you may have only seen on TV. Starting in the Red Centre is the five-day guided Larapinta Walk. 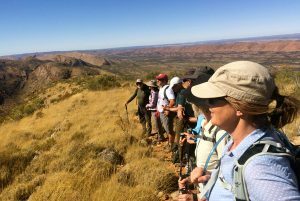 The Larapinta Trail is fast becoming a bucket list destination for many hikers and your professional guides will show you what all the fuss is about. Highlights include walks to Stanley Chasm, Ormiston Gorge and Counts Point. You’ll also get to experience the glory of Mount Sonder made famous by Aboriginal artist Albert Namatjira. Accommodation and meals are first class and for an extra “Wow!” factor you get to see this ancient part of the country from a helicopter. Also Life’s an Adventure is proud to work with Deanella Mack, a local Arrente woman, born and raised in Alice Springs. You’ll meet with her at Stanley Chasm and learn about the rich Arrente culture. Heading north, Life’s An Adventure has two wonderful walking experiences from Darwin. 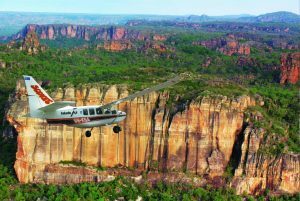 The first is the five-day Kakadu and Beyond walk which explores the spectacular stone escarpment and dramatic scenery of Kakadu National Park. But your first stop is Litchfield National Park with is gorgeous waterholes and curious magnetic termite mounds. You’ll then hop on a boat on the East Alligator River but don’t worry there are no alligators… just lots of crocs! (Which you’ll be able to see from the safety of your boat). And your Aboriginal boat guide will tell you all about life in Arnhem Land. Kakadu is filled with ancient rock art that has stood the test of time and you’ll learn what the art means, their symbols and some of the Dreamtime stories behind them. Walking highlights include Jim Jim Falls, Ubirr rock art site, and exploring the Hawk Dreaming wetlands – a unique area most tourists aren’t allowed into. The last walk in the seven-day Walk the Top End, which includes the above five-day walking experience plus an extra two at Nitmiluk National Park (aka Katherine Gorge) and the spectacular Edith Falls.